In the mid-1800s, Texans began to focus their attention on a future that had been dramatically altered by the devastation and economic upheaval of the Civil War. Settlers were moving west, businesses began to flourish and cattle drives became a common sight. For the progressive Waco leaders, this dilemma was both a problem and an opportunity. The obstacles to building a bridge spanning the Brazos were staggering. There were no local engineers or even machine shops. The railroad was still 40 miles away. Money was scarce. Consequently, a private company was formed which secured a charter from the state on November 1, 1866. Real progress began May 8, 1868, when officers of the company were elected. Col. John T. Flint, an Austin lawyer and banker, who had moved to Waco after the war and established a banking firm called Flint & Chamberlain, was elected president. A subscription book was opened and by August, $50,000 had been subscribed to finance the project. The company decided to retain the renowned New York firm of John A. Roebling Co. That firm had originated the suspension span bridge concept and later oversaw the building of the Brooklyn Bridge. Col. Flint went personally to New York to handle the deal. In October of 1868, Chief Engineer, Thomas M. Griffith arrived in Waco to begin preliminary plans. The shifting sandy banks made the setting of piers and anchor houses extremely difficult, but by January of 1869, the actual construction was underway. It took 2,700,000 bricks from Wacoan J.W. Mann and $135,000 to build the 475 foot span. It was the first pedestrian/wagon bridge built across the Brazos River - at the time, it was the longest single span suspension bridge west of the Mississippi. Upon completion in January of 1870, the Suspension Bridge brought the Texas section of the Chisholm Trail straight through Waco. 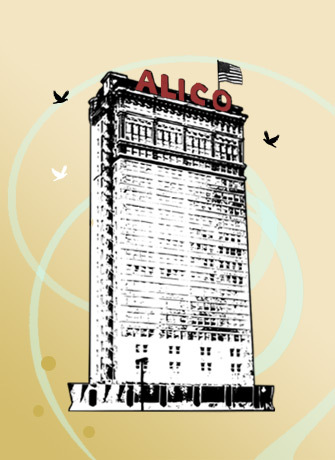 A year later, the railroad was extended into Waco, and the city became a flourishing trade center. For 20 years after the bridge's completion, a toll was charged for each person and each head of cattle that crossed on the span. In 1889, McLennan County, by a bond issue of $80,000, bought the bridge from the private company and transferred the deed to the City of Waco for one dollar, with the condition that the bridge be maintained and operated as a free public highway. 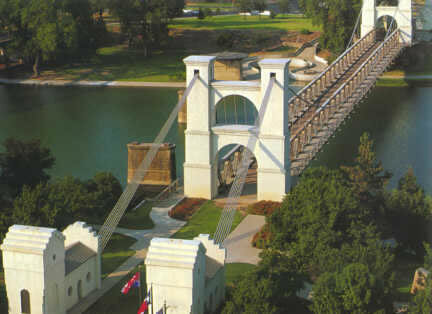 The historic downtown Suspension Bridge is the centerpiece of present-day Waco and is surrounded by lovely city parks. Indian Spring Park is on the west bank and Martin Luther King, Jr. Park is on the east bank. A beautifully landscaped river walk connects the bridge to the Waco Tourist Information Center and to the Texas Ranger Hall of Fame and Museum at Fort Fisher. Just past the bridge in the other direction from Fort Fisher is Cameron Park which is a 416-acre park boasting picnic and playground areas, trails open to mountain biking, horseback riding, and hiking, scenic cliffs and Miss Nellie's Pretty Place, a beautiful wildflower preserve.